If you wish to climb up the ladder at your office, there is one person you must satisfy. No prize for guessing, it is your boss. However, it is not always easy to satisfy your boss; especially, if he is an introvert. Introvert bosses are very difficult to work with. How would you know what your boss expects of you, if you are not told about it? The good news is, there are ways which can be very useful to handle an introvert boss. It’s all about man management. What are the Problems with Introverted Boss? If you are wondering what problems you might face with an introvert person as your boss, then there are quite a few. Inefficient job allocation which could create a total confusion. When you are in a state of confusion, you would want your boss as your mentor. If he is an introvert, then you cannot expect any advice or suggestions from him. Since you are not sure about what you are supposed to do, you will always be in a state of anxiety and fear. Over a period of time, this could lead to something as serious as a nervous breakdown. So, the implications are quite clear. You will be the one who would be in all kinds of trouble. Therefore, you need to take the initiative and make him talk. At times you would be desperate for him to open up, but you cannot probe beyond a certain point because he is your boss! So, do you quit? Of course not! There are ways to handle this situation. How to Deal with an Introvert Boss? You know it for sure that your boss is not going to open up beyond a certain point, no matter how much you probe him. And that “point” might not be sufficient for you. You need more, because you know that he will be the first person to yell at you if you don’t get it right. So, take a different approach. Instead of asking, tell him what your plan of action would be, how you want to approach the given situation. The moment you come out with something he doesn’t approve of, he will let you know precisely what he wants you to do. Listen carefully to what he has to say. He may have said what you wanted him to but missed out because you were not attentive enough. Bosses don’t like to repeat themselves, especially those who are introvert. So, mark his words and after he has finished, paraphrase what he has told you. If you got it wrong anywhere, no matters how introvert, he is, and he is going to rectify you. Make sure you speak with full authority while you are communicating with your boss. Make him feel that you are in control and you are going to do it in your own way. If he is perfectionist or an egocentric person who wants people to follow his instructions, then this attitude of yours will help him open up. He will tell you how he wants things to be done. An introvert boss would be reluctant to appreciate your good work. When you are expecting a pat on your back or a “well done”, he might simply pass by. This can be disappointing. However, this is how he is! Remember, if was not satisfied with you he would have certainly expressed his grudge. His silence conveyed those words which you wanted him to utter. Being aggressive and expressive doesn’t mean that you get carried away and go on and on. An introvert person tends to get into a shell if he is in a company with someone who talks too much. You need to be precise, to the point. The idea is to allow him some space to express himself. If you keep on expressing only your ideas, suggestions and opinions, he will not get the time and scope to open up and to brood over the same. Though this is not the easiest thing to do; however, it is a very effective way to handle an introvert boss. In order to master the skill of reading minds, you need to be a very good judge of character. The more time you spend with your boss, more you will get to know about submerged thoughts. In every office you would find a senior colleague who knows exactly what the boss likes, what his mood is likely to be, what turns him down and other aspects of his nature. You can acquire this skill with experience. There are individuals who don’t like to speak much. However, this doesn’t necessarily mean that they are any less expressive. Given the right channel of communication, they would certainly speak their mind out. If you feel that your boss is one such individual, then you may try and communicate over email. Given the fact that he no longer needs to open his mouth, which for some reason he is reluctant to do; it can be assured, even your boss would like this idea. This can be very helpful if you are a new joiner. Let’s be honest, as a new newcomer, it is not possible for you to straight ways get into accessing your boss or try to read his mind. It might take you some time to figure out that he is an introvert. However, your boss is not going to wait for that long and he would want you to do what he expects of you. Though, he wouldn’t let you know what his expectations are in a clear and precise manner. This can be very frustrating. Seek help from your seniors, who by now, knows what their boss expects of his subordinates. There is no point dwelling on having an introvert boss who wouldn’t set any clear standard. At the end of the day, it is you who is expected to get the work done. So, take charge of the situation and make your own decisions. Remember, you may well end up making wrong moves; however, you can use it as a learning curve. If you want your boss to open up, then you cannot be an introvert. If you show the same level of reluctance in communicating, then it can be very damaging; for you of course! If you don’t speak up, then your boss won’t feel the urge to open up. You must let him know that you want clear and precise instructions from him. In order to make to realize it, make sure you speak up whenever you need to. A Norn-verbal cue at times speaks volumes. If you know how to read them, then you can certainly make out what is going on in your boss’s mind. This can be very useful to deal with extra-introverts, who would speak up even if you are going in the wrong direction. While you are telling him about your plans, try and read his face. Being a matured individual you will be able to understand whether he likes your ideas or not from his facial expressions. Introverts tend to open up to those who are close to them. Try and develop a casual relationship with your boss, share some of your personal life with him. It is all about developing a comfort zone, which is very important to make introverts open up. The moment he feels that he is in that comfort zone with you, he would start communicating more than what he does with other people. Though it will take some time, but eventually, it will pay off. Introverts need a push to speak up. If you are dealing with an introvert boss and you know that he won’t let you know about his expectations in clear terms, then you need to take the initiative. You must be direct. Ask for his opinion. Once you throw a direct question, he will not be able to avoid it. If you don’t get a satisfactory answer, ask a follow up question. This is a naughty way to make your boss speak! At times you would get an idea what your boss wants you to do on a particular matter; however, since he is reluctant to speak, you are not sure whether you are thinking in the right direction. This creates a dilemma. Here you can pretend to be an absolute dumb and make your boss realize it. When he will find that his introvert nature is not going to work with you, he will have no other option but to open up. He might end up being and extrovert, in order to make you understand what is expected of you. Don’t wait for your boss to intervene. Read the situation in hand and react to it. You need to read the situation and assess where it might lead to. Being proactive would make sure that you have full control of the situation and you don’t need your boss to guide you. Complete dependence on an introvert boss in a difficult situation might sometime take a toll of you. So respond accordingly using your own discretion. 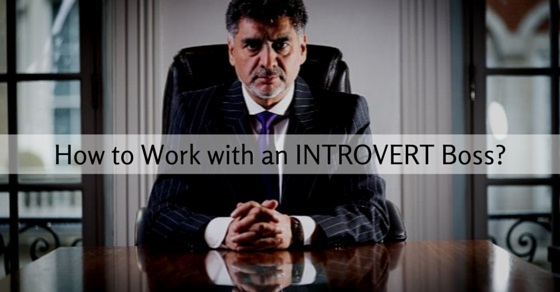 Though, there are no established standards to deal an introvert boss; however, these tips have proved to be quite useful. It is very important to remember, that your boss is introvert by nature, he is not pretending to be one! So, make sure you don’t lose your cool and maintain your composure. It might happen that despite of all your efforts, your boss would remain unmoved. In that case, you need to be open up and go beyond your limit to a certain extent. Let your boss know that you are having some problems due to his reluctance to communicate and you expect him to be clear and prompt with his instructions. Don’t hesitate to cite few examples from the past where things went wrong because you were not sure what to do and didn’t get a proper response when you approached your boss. Though, it might sound being a bit too aggressive; however, this is the last option you have. Present your case in a polite manner and also incorporate some element of satire into it. This would send a clear signal to your boss, that if he doesn’t open up, he is the one who would suffer eventually.